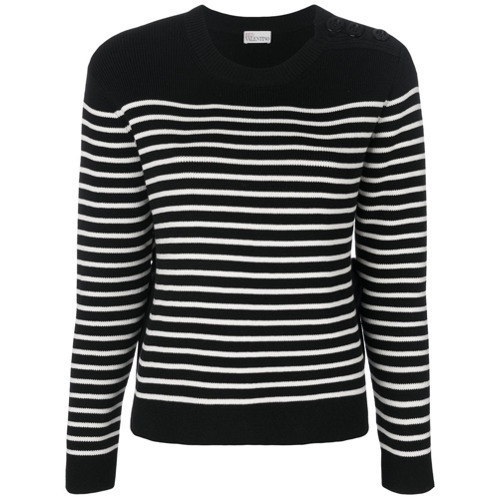 If you're after a casual yet totally stylish look, dress in a RED Valentino striped jumper from farfetch.com and black skinny jeans. Both garments are totally comfy and will look fabulous paired together. Finish off with black suede low top sneakers and off you go looking stunning. If you're all about relaxed dressing when it comes to fashion, you'll love this extra cute combo of a RED Valentino striped jumper and a black pleated leather mini skirt. Lift up this look with red suede ankle boots. If you're in search of a casual yet totally chic look, rock a RED Valentino striped jumper from farfetch.com with a blue denim button skirt. Both garments are totally comfy and will look fabulous together. When it comes to footwear, this outfit is finished off well with black leather ballerina shoes. Consider pairing a black and white horizontal striped crew-neck sweater with a black skater skirt if you're on the hunt for an outfit idea for when you want to look casually cool. Make black leather ankle boots your footwear choice to take things up a notch. 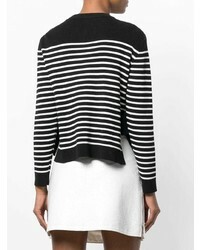 If you're on the lookout for a casual yet absolutely chic ensemble, marry a black and white horizontal striped crew-neck sweater with black leather skinny pants. Both pieces are totally comfy and will look fabulous paired together. Throw in a pair of navy low top sneakers for a more relaxed feel. If you're in search of a casual yet totally chic look, rock a RED Valentino striped jumper from farfetch.com with black floral skinny pants. Both pieces are totally comfy and will look fabulous together. Opt for a pair of black leather lace-up flat boots to make the look current. 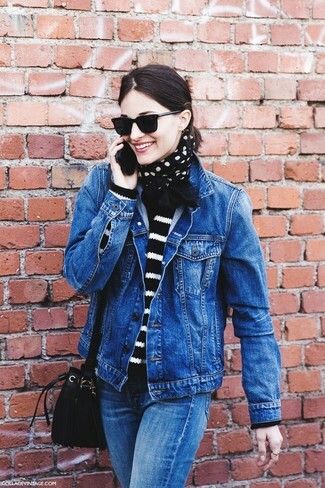 A black and white horizontal striped crew-neck sweater and blue jeans is a great pairing to impress your crush on a date night. 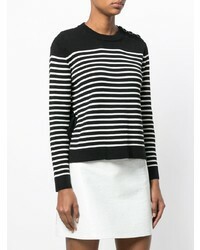 If you're obsessed with functionality dressing when it comes to your personal style, you'll love this super cute combo of a RED Valentino striped jumper from farfetch.com and a black mini skirt. Wearing a pair of black suede ankle boots is an easy way to add some flair to your look. A black and white horizontal striped crew-neck sweater and a tan leopard skater skirt are great essentials to incorporate into your current wardrobe. Spruce up this outfit with black suede pumps.